The GDP per capita ratio of Brazil and the US during the period after 1950 fluctuated greatly. The GDP of Brazil in comparison to the US exhibited temporary bouts of improvement, as seen by the ratio decreasing, followed by an increasing in the GDP per capita ratio of a similar magnitude. The GDP per capita ratio shifted from 0.168 in 1951 to 0.213 in 1961, but then by 1966 had fallen back to 0.178. By 1982 the GDP per capita ratio was at an all time high of this period reaching 0.259, although by 2003 the GDP per capita ratio had shifted back to 0.189. Overall, Figure 1 below suggests that Brazil was merely keeping up with the US in terms of GDP per capita instead of falling further behind, where several attempts were made to catch up with the US but were unsuccessful in the long run. Source: United Nations Human Development Report 2014 Statistical Appendix (Access at: http://hdr.undp.org/en/data). The GNI per capita (Gross National Income) refers to the aggregate income of an economy generated by its production and its ownership of factors of production, less the incomes paid for the use of factors of production owned by the rest of the world (GNI per capita 2014). Due to the nature of this indicator being highly economically orientated three other indicators have been chosen. These include the Prison Population per 1000,000 people, the Expenditure on Health as a percentage of the countries GDP and the Human Development Index. The Prison Population Index consists of the number of adult and juvenile prisoners (including pre-trial detainees, unless otherwise noted) and is expressed per 1000000 people (Prison Population 2014). This indicator was specifically chosen as it has the ability to indicate crime rates of the country that other indicators, such as the Gross National Income, cannot. When assessing the living standards of a country, crime rates can greatly influence the well being of a population. For example, if crime rates are high and the Gross National Income of the country increases, this increase in income may be spent on new security systems and self defense lessons instead of other luxuries like a special holiday. In this case, without the Prison Population indicator the crime rates of the countries that contribute to living standards would go unnoticed. Brazil, as seen above in Table 1, has a comparatively lower prison population that the US. The Expenditure on Health is simply the sum of public and private health expenditure as a percentage of the GDP. It covers the provision of health services (preventative and curative), family planning activities, nutrition activities, an emergency aid designated for health but does not include provision of water and sanitation (Expenditure On Health 2014). Alike the Prison Population indicator, the Expenditure on Health indicator when used in conjunction with the GNI, provides a more rounded indication of a countries living standards by assessing not just their financial health and security but also their physical and mental well-being. Physical and mental well-being are the particularly important as they may also indicate the living stands of the countries environment and how safe or healthy it is. The significantly lower expenditure on health care of Brazil compared to the US may indicate lower levels of health issues in Brazil comparatively. In contrast, it could merely indicate Brazil’s focus on healthcare to be very minimal compared to the US. The third, and most important, extra measure of living standards is the Human Development Indicator. This is because the Human Development Indicator consists of 4 other indicators as its components. These indicators are the GNI, Expected years of Schooling, Mean years of Schooling and the Life expectancy at birth. As a result the HDI encompasses a broader range of human living standard indicators than the GNI alone. Additionally, it is the most valuable indicator for conveying extra information about living standards for Brazil as when used in comparison to the GNI, of which is one of its components, it also reveals the level at which the GNI is aiding living standards. Should the GNI be large and increasing coupled with a shaky HDI, this can also signal to countries the potential need for policy change. The HDI levels of Brazil are several levels below that of the US. During the period after 1950 there was a phase where the GDP per capita of Brazil increased in comparison to the US. This phase was approximately from 1950 to 1980 and can be explained, in part, by structural change in the composition of economic activity. This period of GDP per capita growth involved Latin America developing at a relatively moderate level and was characterized by the implementation and usage of ISI (Import Substitute Industrialisation). Initially in response to World War One and the Great Depression, this structural device had to be employed on a global scale. However, after World War 2 Latin America made a deliberate decision to keep employing this form of trade. ISI refers to the trade that advocates replacing imports with domestic production, on the principle that countries should reduce their foreign dependency through local production of industrialised products to create self-sufficient economies (BusinessDictionary.com 2014). This resulted in short-run gain for Latin America where-by they experienced an increase in industrialization, higher rate of economic growth and higher wages in the manufacturing industry. However, these growths were unsustainable. ISI does not capitalize on Latin America’s comparative advantage that included exports of temperate climate foods, tropical foods or minerals as evident in Figure 2 below. These figures come from prior to the Latin American implementation of ISI where their doors to the international trade market were open and prosperous. Source: The Economic History of Latin America Since Independence – Bulmer-Thomas, Table 3.2. Due to a decrease in exports and a consequent lack in production in new consumer goods that comes through new exports, Latin America experienced an increase in their imports of raw materials and capital to develop ISI. 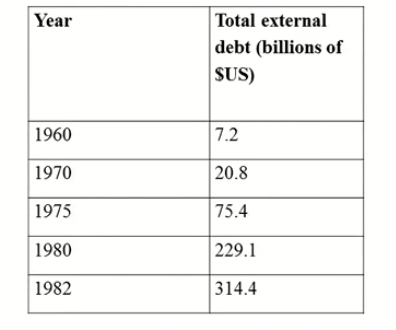 This resulted in the dangerous growth of external debt as depicted below. By the 1980s the GDP per capita ratio of Brazil to the US began to decline and in 1990 Latin America employed a structural change called The Washington Consensus. This involved the opening of international trade, restructuring of the public sector and the promising potential of macro economic stability. However, due to the lasting effects of the ISI structure which resulted in such a large debt and reduction in the labour market to industry. Brazil was left with macro instability and slow improvements in its economy. This involved Brazil merely maintaining a more steady GDP per capita ratio with the US compared to before. 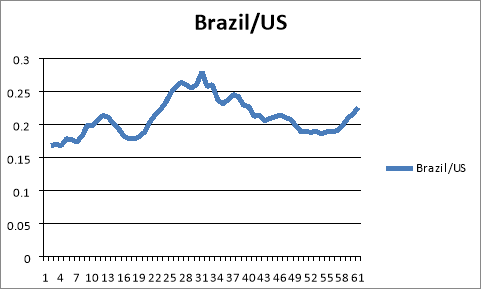 Brazil’s post 1950 GDP per capita ratio increase, in comparison to the US, reflects the important role that economic structure and structural change played in the development of Brazil and ultimately the broader Latin America as they switched from open international trade and country specialization of products to ISI and back to a more openly exporting economic system. Institutions, as a fundamental determinant of development have significantly influenced Brazil’s economic development in the period since 1950. The induction of the ISI, implemented by the government, saw the dramatic shift in Brazil’s composition of exports. Exports of main agricultural products, such as coffee, dropped to an average of 56% in the 1960s, then to 43% in the 1970s, and further to 24% in the 1980s. These figures stand in stark contrast to the former 74% export levels in the 1950s (Aldrighi n.d.). Furthermore, the classification of exports by their technological content reveals that the average share of manufacturers increase by 31% from 19% to 50% during the 1950s to the 1970s (Aldrighi n.d.). The consequent trailing of industrial exports behind the development of import-substituting industries put significant constraints upon the balance of payments in Brazil and the management of its macroeconomic policy. Here, the intentional employment of ISI by an institution has unequivocally influenced the course of Brazil’s economic development. This dramatically stagnated the economic growth of Brazil during a time when other countries, who had abandoned the ISI strategy such as those in Asia, were beginning to flourish. Alternatively, it is also suggested that Brazil as a part of Latin America, is an original example of an elitist and particularly oligarchic society. These traits, exhibited by the institutions of Brazil and Latin America, have not been to the betterment of economic policy. This is due to the fundamentally charismatic nature of the leaders within these societies’ institutions having the tendency to emphasise tactical and ephemeral distributional approaches in an effort to acquire political support. This may underpin the reason Brazil maintained the ISI structure for so long due to powerful constituencies within its institutions that gained from the employment of the ISI system. Aldrighi, D. (n.d.).Industrial Growth and Structural Change: Brazil in a Long-Run Perspective. 1st ed. [ebook] Butantã: Department of Economics – FEA/USP. Available at: http://www.fea.usp.br/feaecon/RePEc/documentos/RenatoDante10WP.pdf [Accessed 10 Oct. 2014]. Bulmer-Thomas, V. (2003).The economic history of Latin America since independence. 2nd ed. Cambridge, U.K.: Cambridge University Press, pp.Table 3.2 & 10.5. BusinessDictionary.com, (2014).What is import substitution industrialization (ISI)? definition and meaning. [online] Available at: http://www.businessdictionary.com/definition/import-substitution-industrialization-ISI.html [Accessed 10 Oct. 2014]. Hdr.undp.org, (2014).Data | Human Development Reports. [online] Available at: http://hdr.undp.org/en/data [Accessed 10 Oct. 2014]. Hdr.undp.org, (2014).GNI per capita in PPP terms (constant 2011 PPP$). [online] Available at: http://hdr.undp.org/en/content/gni-capita-ppp-terms-constant-2011-ppp [Accessed 10 Oct. 2014]. Hdr.undp.org, (2014).Prison population (per 100,000 people). [online] Available at: http://hdr.undp.org/en/content/prison-population-100000-people [Accessed 10 Oct. 2014]. Hdr.undp.org, (2014).Expenditure on health, total (% of GDP). [online] Available at: http://hdr.undp.org/en/content/expenditure-health-total-gdp [Accessed 10 Oct. 2014]. "Economic Analysis of Brazil." UKEssays.com. 11 2018. All Answers Ltd. 04 2019 <https://www.ukessays.com/essays/economics/economic-analysis-brazil-8949.php?vref=1>. "Economic Analysis of Brazil." All Answers Ltd. ukessays.com, November 2018. Web. 21 April 2019. <https://www.ukessays.com/essays/economics/economic-analysis-brazil-8949.php?vref=1>. UKEssays. November 2018. Economic Analysis of Brazil. [online]. Available from: https://www.ukessays.com/essays/economics/economic-analysis-brazil-8949.php?vref=1 [Accessed 21 April 2019]. UKEssays. Economic Analysis of Brazil [Internet]. November 2018. [Accessed 21 April 2019]; Available from: https://www.ukessays.com/essays/economics/economic-analysis-brazil-8949.php?vref=1.